I was getting email confirmations and I must has messed with a setting and am now not getting the email when someone registers. How can I fix this? Still cannot get the prices larger or in a different color font. I am using PayPal. Can this be changed? I have gotten a few support emails but they don't get me to where I can change the price fonts or size of fonts. Larger and in black or blue would be great. I noticed that you have two unrelated questions so I will use this thread (I need to receive an email confirmation) to answer the issue that you are having with your email notifications. Please create a new thread for the question that you have about the font size and font color of the prices. That way we will be able to track each issue separately and provide better assistance. While looking on the form in your account I noticed that there was no Email Notifications setup. 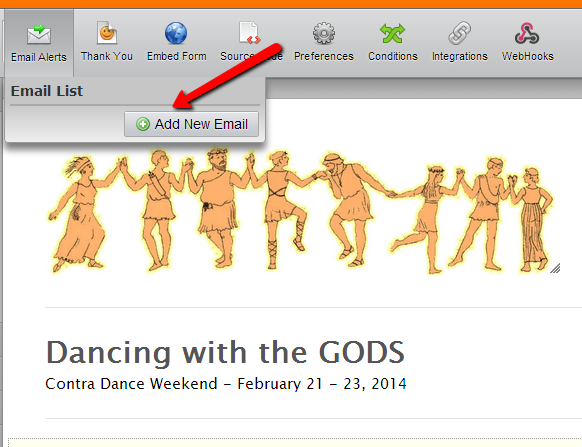 Please follow this guide for instructions on how to create your email notification. Please let us know if you need any further assistance with your email notifications here.